New Zealand participated in the South African War of 1899–1902, and during this period flags flew throughout the country to a much greater and more regular extent than before. Many people were confused over which flag to fly – the Union Jack or the New Zealand Blue Ensign (officially flown by naval vessels only). 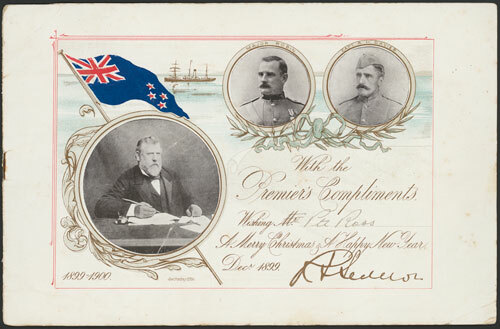 Premier Richard Seddon took the matter in hand, and in 1900 introduced legislation into the House of Representatives to make the Blue Ensign with the four red Southern Cross stars (but not the white disc) New Zealand's official flag. A modified version of his bill was passed in 1902 and the Union Jack was replaced by the current New Zealand flag. This Christmas postcard was sent by Richard Seddon to Private Ross, who fought in the South African War, in 1899. It shows the naval New Zealand Blue Ensign, which was to become the official New Zealand flag.